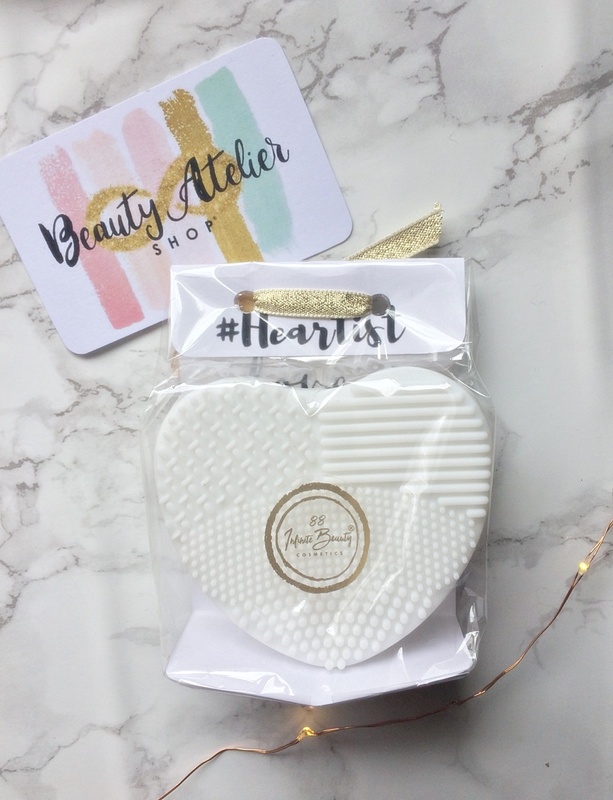 As Told By Kirsty: Beauty Atelier Shop: #Perfectionist Make Up Sponge & #Heartist Make Up Brush Cleaner Review * Plus Free Delivery Code! 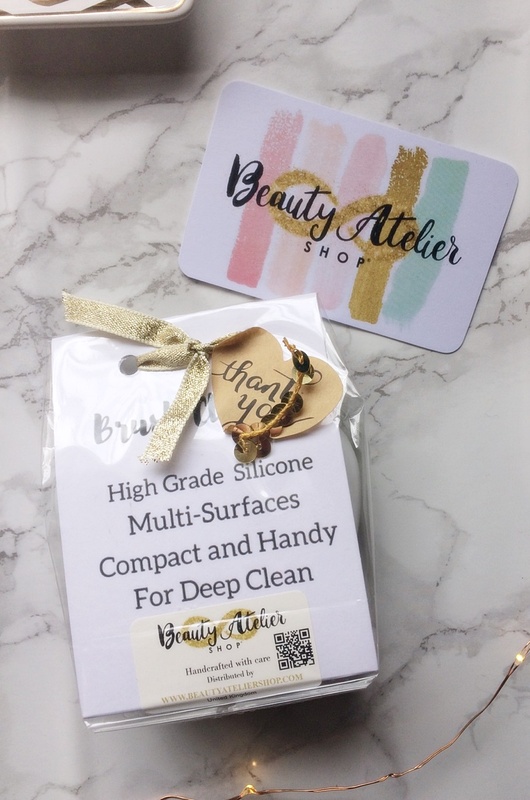 Beauty Atelier Shop: #Perfectionist Make Up Sponge & #Heartist Make Up Brush Cleaner Review * Plus Free Delivery Code! Today's post is all about my thoughts on these makeup tools from Beauty Atelier Shop. 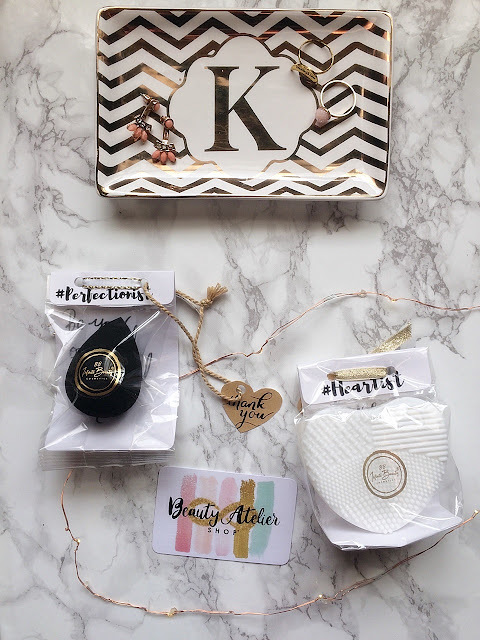 I kindly received the #Perfectionist Make Up Sponge and the #Heartist Make Up Brush Cleaner to try out and review, as well as some other products which you can read all about in my First Impressions post here. Beauty Atelier sell high-quality makeup tools and also false eyelashes which are supplied by 88 Infinite Cosmetics. Everything they sell is handmade and cruelty-free. I love the cute, handmade vintage looking packaging of these products and the fact that everything they sell is named with a hashtag. I also received a promo code so that my followers get free delivery which I will pop at the bottom of this post! 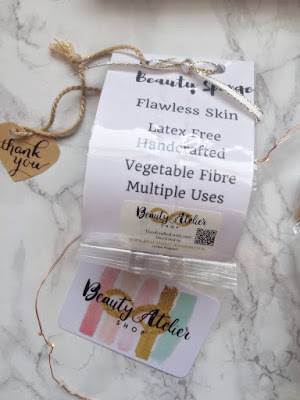 So first up is my thoughts on the #Perfectionist Make Up Sponge/Blender - The makeup sponge is made from vegetable fibre and is has been made so it will not waste any of your product, like most beauty sponges do. It's also Latex free. I usually stick to my Real Techniques Miracle Complexion Sponges. But I have noticed that they do eat up and waste some of my makeup product. So it was nice to try something new! I used this with my go-to foundation, which is the L'Oreal Infallible Matte in shade Porcelain and I loved it! It expands loads when used damp and it applied my make up really well and it looked nice and natural but also a little dewy. The sponge itself feels quite tough and well structured, which is another reason why I like it. It also didn't waste any of my makeup product. Overall I really like this! I've been using it over the past week and it hasn't let me down. 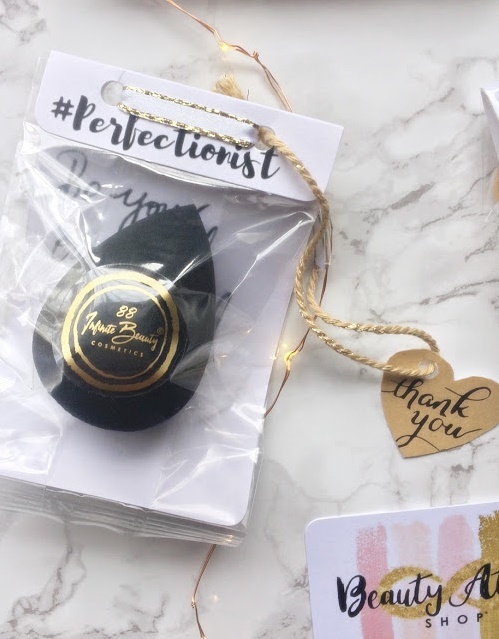 The #Perfectionist make up sponge is £12 and I definitely recommend you to try it! I also received the #Heartist Make Up Brush Cleaner. Which is just so cute! It feels like really good quality (because it's made from high grade silicone) and it isn't flimsy at all. I also really like that it has 4 different patterned nodules to clean different types of brushes. (The brush cleaner I'm currently using only has 2) This adorable looking brush cleaner is also easy to hold and to use. I cleaned all my dirty brushes with this and they all look lovely and clean again. I really love this and it's only £8! As I said in the intro I love the packaging of all of the products I received from Beauty Atelier Shop. I thought I'd add in a few more photos of the packaging of both #Heartist and #Perfectionist. I think they'd made such great little gifts for people who you know, who like handmade gifts as well as their makeup tools/products. Which of the two do you like the look of most? That makeup brush cleaner is adorable! I'd honestly be tempted to buy it just because it's so cute tbh haha. I like the sound of the sponge, too. I love my beauty blender type sponges for foundation, but hate the waste product!